You don’t need me to tell you that canned wine is kind of hip. Chalk that up to a winning combination of novelty, extreme portability, and the kind of casual anti-snob vibe that appeals to young urbanites with disposable incomes these days. No real mystery that canned wine is hip, and we put everything in cans (Washington State University has beencanning a very nice cheese since the 1940’s), so why is canned wine still a mystery to me? Every time I see wine in a can, I wonder about how it got there. How do winemakers need to think about canned wine differently? Does the canning process need to be altered to avoid damaging the wine, or is it just the same as canning a pale ale, or diet cola? What is the science behind canned wine?Then I realized two things. The first: I was overthinking this. The second: the science of canned wine is really more like the science of wine, in a can. In other words, it’s not that complicated. Canned wine is designed with not overthinking in mind. Oregon’s Union Wine Company markets their Underwood-brand canned pinot and chardonnay with online videos that lambast oenophiles who overthink their beverage choices. Denver’s Infinite Monkey Theorem urban winery works hard to play up the “don’t worry about it” vibe of their line of easy-drinking still and sparkling wines. (Generally speaking, not overthinking seems a good strategy for a night out in downtown Denver no matter what you’re drinking.) 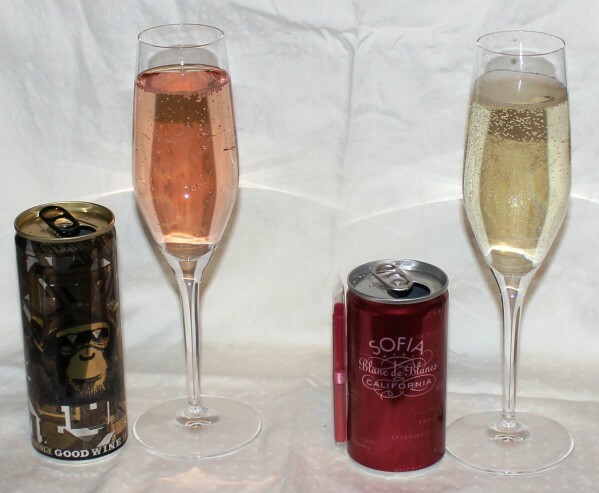 Francis Ford Coppola has been packaging the bubbly Sofia in baby-sized chic pink cans, with straws, for a decade now. The package practically says, “I’m sipping on sparkling and I’m not overthinking this.” In some ways it’s a funny paradox: canned wine is still non-standard enough that you probably did think about it (unless you’re out on a drunken ramble through Denver, maybe), and Sofia has always looked like it pairs really well with those “beachy wave” hairstyles that use four products and 45 minutes of a professional’s time for something like what happens when I’m traveling and forget to pack my hairbrush. Beachy waves are a good example of how plenty of seemingly simple things actually require a lot of advance planning. Canned wine is not one of them, or at least not as far as the winemaking side goes. The science of canned wine involves three main considerations: exposure to metal, oxygen management, and can pressure. High-end can manufacturers take care of the first one. Well in advance of any actual canning, some very thinking-intensive materials science goes into designing (BPA-free) epoxy resin coatings that ensure that the aluminum you touch on the outside of the can never touches the beverage on the inside. Major improvements in those liners (which is to say, major improvements in materials science) are the reason why canned beer is now a serious alternative to the bottled stuff rather than a vehicle for tinny-tasting dishwater. On to oxygen. If you’ve followed any of the cork versus screwcap debate, you know that the big issue, apart from the amount of auditory pleasure involved in opening the bottle, is about how much oxygen comes in through the closure during bottle aging. Corks are porous and traversed by imperceptible amounts of air. Over years in a bottle, the microscopic amount of oxygen involved in that transaction is enough to affect chemical reactions involved in how wine flavor, color, and mouthfeel change with age. In the worst scenario, a faulty cork lets in so much oxygen (even though the bottle remains sealed) that the wine spoils just as if you’d left a two thirds-empty bottle open in your kitchen over the weekend, only more slowly. In the best scenario, wine ages gracefully: harsh tannic edges soften, earthier dried fruit aromas evolve from fresher ones, and purple-reds are replaced by bricks that look especially flattering in candlelight. Cork critics say that in any case, you’re dealing with something unknown and highly variable, while screw caps either exclude oxygen entirely or (for specially engineered closures) deliver a controlled amount of oxygen you can count on. Cans are just another alternative closure option. Cans, like the aluminum screw cap, completely and consistently exclude air. This is horrible news for something like a fine Barolo that you want to take on aged character over time. This is great news for the kind of wine that ends up in cans – the fresh, drink-it-while-it’s-young kind – because excluding oxygen preserves those bright, fresh flavors that are half the reason (along with the whole can-thing) you’re drinking it. The kind of ultra-fresh sauvignon blanc that made New Zealand the screw cap-ital of the world would be great in cans. No one’s going to try canning Barolo. Liners and oxygen management involve incredibly complex chemistry but are simple when it comes down to applying wine to can. Pressure is a simple concept but a lot trickier on the practical side. When a beer can is empty, it’s easy to crush. When a beer can is full, it’s hard to crush, and not just because it’s full of liquid. Beer and soft drinks are carbonated; they contain dissolved carbon dioxide that escapes as bubbles under normal atmospheric conditions, like your kitchen or a bar. But cans are closed systems at equilibrium. In a can, carbon dioxide will escape from the beer or soda just until the pressure of the gas pressing against the liquid is enough to keep more from escaping, which is why a glass of beer goes flat overnight in your kitchen but stays fizzy for years in a can. That carbon dioxide isn’t just pushing against the liquid; it’s also helpfully pushing against the walls of the can so that crushing the can requires some serious effort. Bottling sparkling wine works the same way. Bottling (canning) still wine requires some extra thought. Think about a full plastic water bottle: the pressure of the water inside isn’t enough to keep you from smushing the bottle even when it’s full. A smush-free canned wine experience requires pressurizing the inside of the can enough to provide the sort of sturdiness we expect out of an unopened beer can, but not so much pressure that popping the top delivers a wine volcano. A good solution involves adding a precise amount of liquid nitrogen to the can. Liquid nitrogen is very cold, but completely harmless to the health of both you and the wine. When it warms up, as it very rapidly will after being injected into a can, the liquid becomes a gas. Gaseous nitrogen occupies much more space than liquid nitrogen, and so the gas presses against the walls of the can (and the wine) and delivers anti-smushability. The smushing problem also seems to explain why those cans of green tea my father used to bring back from Japan in the 1990’s, and today’s non-carbonated canned coffee drinks, come in extra-sturdy, thick-walled little cans. But what with the wine industry’s interest in low carbon footprints (thicker cans are heavier), and the appealing idea of using ordinary aluminum cans and an ordinary beer bottling set-up, liquid nitrogen is a better option. And if canned wine doesn’t convince you of the worthwhileness of those goofy experiments your high school physics teacher did with balloons and gases taking up space, I don’t know what will. Back when I worked in a microbiology lab, one of my colleagues had a can of wine on the shelf above his desk. Some friend had bought it for him as a joke, because when you research wine all of your friends who don’t research wine think that all wine-related things become enormously funny. Wine research isn’t a joke, and it’s not about getting drunk all the time. Canned wine isn’t a joke either, though – let’s face it – it may indeed be about getting drunk.